Leave comment at end for chance to win! The bombing of Pearl Harbor not only brought the United States into World War II, it created a wave of patriotism not since experienced. The day after the “day of infamy,” millions of American men lined up outside recruiting offices to sign up for the military. But citizens at home wanted to contribute to the war effort as well, and eagerly sought ways to help “our boys overseas.” Shortages of materials soon appeared as factories shifted production from consumer goods to military supplies. People learned to do without or make personal sacrifices of goods, knowing that soldiers were supplied first. So when the government issued “War Ration Book One” in May 1942, most citizens willingly complied and adjusted their lives accordingly. 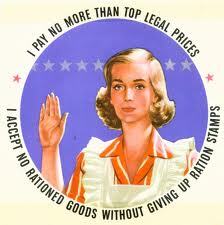 Every man, woman and child in the U.S. was issued a book with rationing stamps through the schools. 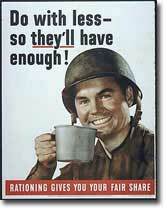 Sugar was the first food item rationed, followed by coffee. 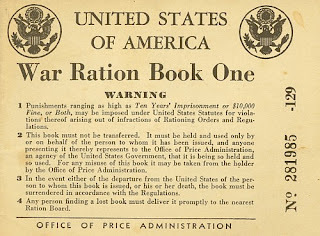 “War Ration Book Two” came out in February 1943, limiting amounts of meats, cheese and processed foods. However, with dwindling supplies at the grocery stores, the food was sold on a first-come, first-served basis, resulting in long lines waiting for stores to open. Once the store’s inventory was sold, there was no more to buy regardless of possessing a stamp or not. In some communities, this dilemma fostered a barter system. The person lucky enough to get their allotted amount of sugar, for example, soon had neighbors at their door, offering a variety of goods in exchange. The first non-food item to be restricted was rubber, since 90 per cent of it came from areas overseas where the Japanese had taken control. Rubber was essential for tires for all military vehicles. On the home front, that meant rubber elastic was no longer available, so clothes such as underwear were made with drawstrings instead. As a result of American oil tankers being sunk by German submarines, gasoline became scarce. Since the government needed to cut down on rubber use as well, they issued gas ration tickets. Many gas stations closed for lack of supply, and those open often had lines 300 cars long. People were known to follow tanker trucks to their destination to get gas. Consequently, many cars ran out of gas and were abandoned on the roads. The other precious commodity to be restricted was metal. No longer were consumer goods made of metal available. People began to reuse what they already had, such as metal zippers, often removing them from old clothes to reuse in new, homemade clothes. The habit of saving and reusing stayed with the people of that era even after the war ended. Later generations would find boxes of buttons, safety pins, and zippers and wonder why Granny saved them. Did you have a family member from the WWII era who saved something? Did you hear stories about rationing? Leave a comment for a chance to win a copy of Chicken Soup for the Soul – Devotional Stories for Wives. They had rations in Australia also and they had them after the war also. Mum got married in 47 and had to use coupons to buy the wedding dress. Friends shared some for it. Also they lived out of town on a farm and had to use rations to buy petrol. Hi Jenny, Thanks for sharing. Hadn't heard of coupons for a wedding dress! And wasn't it nice of her friends to help her get it? Seems like people helped each other out a lot more back then when they also shared in the hardships. I think it was for the material as material was in short supply the same for the linen etc. It was mainly Clothing, butter, Sugar, tea and meat with a few other items at times. I know mum worked in the city for part of the war and boarded with a friend and they would give some of there coupons for food to the land lady who provided some meals for them. I just love hearing these stories about how people pulled together during those times! I have to laugh every time I read about WWII as historical because that was my childhood. I remember rationing, victory gardens, walking instead of driving, and saving "tinfoil" and rubber bands to recycle and help the war effort. We raised rabbits and the people next door had chickens and we didn't live in country. We sold them as well as ate them and exchanged rabbits for chickens with the neighbors. Nylon hosiery was scarce too. That's when my mother and grandmother took an eyebrow pencil and drew a line on the back of their leg to make it look like they were wearing stockings. I used that same trick in college to get out wearing them to church on hot Sundays. My parents married through the depression and I was born at the tail end of the depression. Doing without and saving everything to recycle was a way of life. We were the first to really recycle and it's stayed in my blood. I always think I might find another way to use something I need to throw away. Thanks, Martha! I just read about women drawing lines down the back of their legs to look like stockings! It'd be hard to do that by yourself and get them straight. Isn't it a shame the way this generation is so wasteful? I see it in my children because they think they can always replace things with new ones, unfortunately. My grandfather served in Europe in the latter part of WWII and was part of the U.S. contingent of soldiers running Germany after the war. Because of his service, my grandmother was at the top of the list to get certain household items after American manufacturers started focusing on consumer goods again. She told me that she remembers being excited to be the first woman in her neighborhood to get a new can opener after the war. I know that can openers were around long before that, but it's odd to think of materials being so scarce that you couldn't get something as basic as a can opener during WWII. Walt, I think we don't appreciate things today because they're so easy to get. Can you imagine being excited to get a can opener? Thanks for sharing! Thank you for sharing this history! Those who experienced these things first hand still remember and tend to care for and reuse what they can. Our younger generations seem to rely on replacing rather than reusing. You're right, Britney. And for many of us born to parents of that generation, those habits of conserving were passed down. My father was in WWII. I was born during that time. While my father was away, my mother ran a cafe near Hot Springs, Arkansas. Rationing affected her. When she got her coupons, she went across the small alleyway to the butcher and got as much meat as she could for the cafe. It must've really been hard to run a café during those times, Lena. I wonder if those people got a larger ration than other consumers? I know meat was very scarce. Both my mom and mil are savers. My mom can't stand to see anything go out the door, no matter how pitiful it may look. I just had a discussion with her today and told her lots of people who lived through the depression and war years hated to give away things. My mil never throws out a container of any kind and has cabinets full of them. She even saves the wax paper out of cereal boxes. 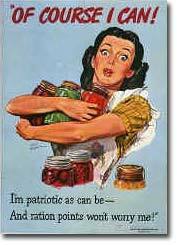 I still have my mom's war ration books. Wow Vickie! And I thought my husband was bad. He wasn't alive in WWII, but his father served, and his mother taught him frugality. He even washes paper towels! 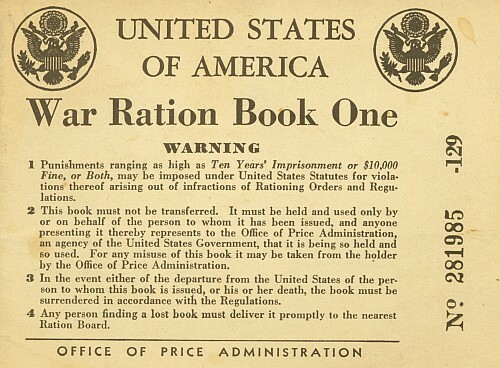 I'd love to see a ration book in person. Vickie my mum saved every plastic bag like the ones things like coconut or icing sugar etc came in she would wash them and keep them. The same with bags we get veggies in. I got to the point I didn't use bags when buying the veggies. The same with containers. She did keep all paper bags and paper even the butchers paper etc. and she reused waxed paper and foil. When she went into care I found so many bags of bags and when I thought I had them all I found more in the shed. Some of these bags were over 30 years old. I do save some containers to use but do recycle a lot. she didn't reuse paper towels. Oh and saving all the little bits of soap that are to small to use she would save them and use them to wash dishes. The irony is she save a lot of these things but got rid of old letters and things that would have meant something to me like the letters and cards she got with notes about dad in them. Jenny, wouldn't it be great to have those old letters and cards now? Perhaps there's a lesson in there for us in what's important to our future generations. Our history is a wonderful asset for all of us. Through life's experiences we learn and we are strengthened. We have our hard times and our easier times and through it all God is and has always been in control. We are a blessed nation. I have heard my parents & grandparents talk about rationing - they were farmers, so probably had access to some foods that non-farmers didn't. My grandfather & father was/is very reluctant to buy a new product if there was/is any possibility of it being repaired - I think that came/comes from living through the depression & rationing. Bonnie, my father was the same way. He put the date he bought something on it and tried to see how long he could make it last! Thanks for the response. Tom Brokaw called them "The Greatest Generation." Maybe someday, we can become a great generation again.